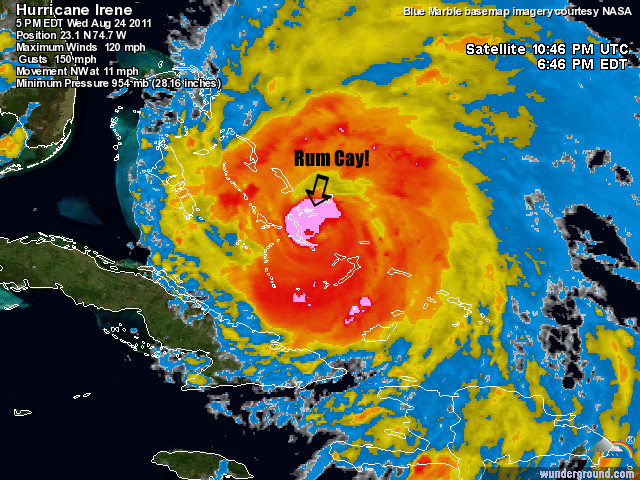 On August 24, 2011 Rum Cay takes a direct hit from Hurricane Irene which was a Category 4 sustaining winds of 140 mph. Luckily there were no civilian casualties! Many houses and local businesses had a lot damages to roofs and rafters. Trees fell over onto roofs and some roofs took out other roofs! The bridge in Port Nelson by the park was taken out by the high water surging out of the salt pond. This separated the town from the marina side of the island. 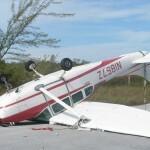 The Rum Cay Airport strip received no damage except to the fencing surrounding the strip which keeps out the wild cows. Phone lines were down for numerous days. And the electricity was down for a minimal amount of time considering the amount of damage to the homes. After having spoke with Josie Harding regarding the state of Rum Cay as of today I am updating this page as follows. There is still a lot of cleaning up to do. The Sir Milo Butler park is still in disarray and the nearest bridge is still down. The phone lines are back up in good working order thanks to the hard work of Jennifer Maycock. Also, the island is fully powered due to Josie Harding’s very hard work as well. The roofs on the houses are not fixed as of yet. 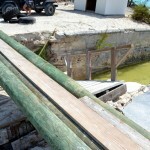 The Bahamas government has sent plywood and shingles to repair the roofs, however, the rafters have not yet been sent. Therefore, they are waiting on the rafters first before they can move forward on repairing the roofs. Josie said that more supplies are loaded on the Lady Frances and heading for Rum Cay leaving today. Some supplies that were sent from NEMA and the Red Cross did arrive which included bottled water and some food which consisted of mostly canned goods. Continuing his tour of islands affected by Hurricane Irene, Prime Minister Hubert Ingraham, accompanied by director of public works John Canton toured Rum Cay and Long Island last weekend. He is scheduled to tour Eleuthera this week. 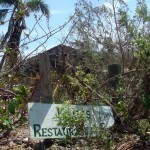 On Rum Cay, the prime minister viewed the island’s clinic, public dock and airport perimeter, which sustained varying degrees of damage during the passage of Irene. Mr. Ingraham advised that the airport’s perimeter fencing will be immediately repaired, as the fencing serves the vital function of preventing livestock from straying onto the airport’s runway. 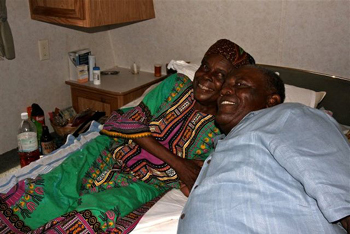 Ms. Delores Wilson who is currently ailing, received a warm and cheerful visit from the prime minister, who is well known to hold a special place in his heart for the elderly of family island communities throughout the country. He noted that the public dock will require urgent repair so as to accommodate mail boat service, and that necessary reconstruction will be done for the island’s clinic. Homes on the island primarily sustained water damage. The Department of Environmental Health meantime will be instructed to assess the waste disposal site on Rum Cay, as it currently sits near a pond. The Rum Cay tour was not only about infrastructural assessments though, as the prime minister took time out to share treasured moments with two of the island’s matriarchs. Dan and Earl are on Rum Cay. Telephones are still out. Dan has a Bahamian cell phone that is working. Number is 242-432-4779. Call me 352-495-4030 or call Dan with instructions on how to get into your house and he will be happy to check out things and relay a report to you. Unbelievably shocked that our house did not sustain substantial damages. Winds must have blown horribly from the Southeast, as the master bedroom shutter blew off and water collected on our mattress (luckily I put a plastic drop cloth over the bed before we closed down). Dan said the rain must have blown in from the roof vent (facing North) and the window that lost the shutter. He collected a gallon of standing water off of the plastic sheet upon arriving yesterday. The wind blew the inside screening off of the East facing living room vent and water and salt blew across the living room. Our carpet was completely soaked and a telephone was destroyed by water. Again, luckily I had plastic tarps over the furniture. Of course, I still think he needs to examine things a little closer. While dried up when he arrived, Dan could see where water had blown under the front door (beach side) and formed a puddle in the center of the room. If at all possible, I would recommend that you have Dan check for inside water damage in your homes. NEMA has co-ordinated the shipment of goods to Rum Cay, Cat Island, Crooked Island and Acklins, consisting mainly of basic food and water supplies. The mailboat should be arriving in Rum Cay today with supplies. Here’s a picture of the Lady Frances standing by for supplies heading to Rum Cay. The dock in Port Nelson is in disrepair and a bridge near the dock collapsed. Residents have made a makeshift bridge out of utility poles that is accessible only to pedestrians. 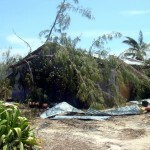 Several homes on Rum Cay were impacted by hurricane Irene. Francita Gardner’s home was one of them. “I’ve lost everything,” she said. 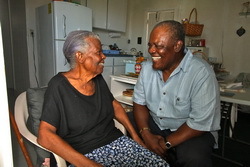 Weda Bain took her wheelchair-bound mother to the local shelter St. Christopher’s Anglican Church. But electricity was up and running in a very short time. BEC representative Joseph Harding and a few good men did line work immediately after the storm passed. “We had the lights back on in one day,” he said. Philip “Brave” Davis was the first to visit Cat Island, Rum Cay and San Salvador without waiting for the government. After observation of the islands Mr. Davis decided that he would not wait for the government because thousands of homes were without roofs. He ordered one thousand blue tarps with his own funds to accommodate these families and we are trying to expedite these for the islands and shipping them through G&G. Foreign homeowners are starting to arrive in Rum Cay to check on their houses and bring some supplies such as tarps. The road in town is still down so transportation from Port Nelson to Sumner Point area is still a matter of walking over a piece of wood and getting into another vehicle on the other side. The roof off of Kaye’s restaurant has blown off. Kaye’s also got quite a bit of flooding. Another roof has blown off a house and landed into Terry Strachan One-Stop Shop. From what I’ve been told the mailboat is due to come in from Nassau on Thursday. However, getting the supplies from the government dock to Port Nelson (wrong side of the bridge) will present a challege. Rum Cay Airport: The runway is dry and ready for arrivals. Be sure to let someone know of your arrival prior to landing to ensure no cows have wandered onto the strip! Power is back on but phone lines are still down making internet access pretty much non-existent. 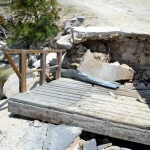 The bridge in town is still down. Lots of people are flying in over the next few days to check on houses and bring any needed supplies. Looks like Kaye’s restaurant has been damaged. Again, there have been no fatalities or injuries so if you are concerned about someone on Rum Cay you can rest assured that everyone came out just fine. Their houses may have a different story however! Brave Davis flew in today to take a look around and assess the damage as well as going to Cat Island and San Salvador. 6pm – We are hearing that the Rum Cay air strip is clear and is good for landing. Please be sure to let someone know when you are arriving so that someone can be there to ensure that the runway is clear of any wanding cows and debris. 9am – I just spoke with Josie and George. Josie had the power on up to 70% last night. He’s working feverishly to get it up to 100%. The phone lines are down so there is no access to internet. I believe there is one person who has other access to internet, therefore, we were able to see some recent pics. Rum Cay Airport: George says that the runway is probably still under water but we will have a firm report on the state of the runway at 5pm. We do know that the fences are down and they do keep the wild cows off the strip. I would think if you have someone at the airport before you land they can ensure that there are no cows on the strip. Sumner Point Marina: From a couple of pictures I have seen it appears that one of the docks alongside the rock jetty has been wiped out. There appears to be some roof damage on the Out of the Blue. The Dive Shack appears to be fine!! Flights to Rum Cay: I just heard that Willem is going to be flying into Rum on Tuesday and has two seats available coming from West Palm Beach, FL. If you are looking for a seat please contact him directly at willem@cortes.net. 9am – Spoken with a couple of people on the island and they are saying that there is quite a bit of devastation on the island! There is a bridge that is down that connects Port Nelson to the Sumner Point Marina and to the houses on that side of the island. We still do not know the full extent of the damage there. 1pm – Received news that the Sumner Point Estates houses are fine. It also looks like the houses down in the Whitelands have received minimal damage which is great. Power should be returned to the island tomorrow! The houses in the settlement of Port Nelson did get damage from flooding and some roofs have also been damaged. I have not heard anything about how Sumner Point Marina fared or how any of the boats that were in there ended up. 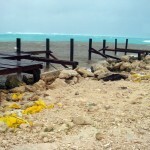 Rum Cay has just started feeling the effects of Hurricane Irene. This is a powerful Category 3 hurricane and Rum Cay is right on its course. The eye of the storm will hit around 9pm tonight but as of 1:00pm people on Rum have reported that it is blowing hard already. 3:30pm….Hurricane update: Just spoke with George Gaitor on the island. He said that they are getting pounded right now. Probably worst than Hurricane Frances but it’s hard to tell. He has no idea what’s happening on the rest of the island as they cannot go outside at the moment. Rum Cay is located at Lat. : N23 42′ 30″ – Long. : W 74 50′ 00″ . Hurricane Irene is sitting at Lat: 22.7 and Long: 74.3. 6:45pm – I just tried calling my Rum Cay contact that had cell phone service earlier and there is NO answer. As of 6:45pm here is the satellite imagery of the storm.